Venice, one of the world's most romantic cities, lives by the legend of the bridge of sighs: When a woman kisses the man of her dreams under the bridge at sunset, she will be together with him forever. So eighteen-year-old Lucy seals her fate in the blush of first love with Nate. Yet ten years later, the pair has completely lost contact-until the day Lucy arrives at Nate's luxury Manhattan apartment with paintings he has purchased from the gallery where she is newly employed. The legend has reunited the couple, and Lucy is overjoyed-until the state of their union is misery. 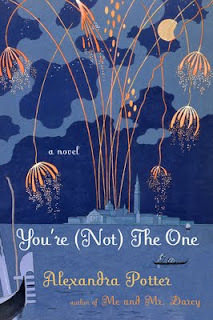 You're Not The One was one of the books I couldn't put down. Written about Lucy Hemingway, a loveable character who appealed to my inner soul, I found myself wanting to find out what was going to happen next around every plot twist and page turn. Lucy Hemingway and Nate Kennedy met as young adults in one of the most romantic settings in the world - Venice, Italy. Legend has it that if you kiss someone under the Bridge of Sighs, you are then bound to them for life. Which about ten years later and many years apart seems to suddenly be the case. Happy about this at first, since they are now both in New York City and bumped into each other unexpectedly, Lucy and Nate start to rekindle their flame. But things start to go sour soon enough unfortunately and then Lucy cannot get away from Nate. And he can't get away from her. Stronger forces at work, destiny or just plain back luck have them constantly in contact with each other, even in a place as big as Manhattan. Lucy also has worries about her sister's problems, and the possibility of the gallery she works at closing. Trying to help out everyone while also dealing with her own situation often has her frazzled so she's lucky she has a great roommate and friend, Robyn, even though Robyn is a bit of a nut. Soon enough though, another interesting prospect (read man) appears on the horizon and Lucy must make some difficult decisions after she realizes that she is truly interested in getting to know the "gallery crasher." Trying to rid herself forever of the "curse" of the legend and also trying to win new interest Adam's heart, this book was an interesting take on what is meant to be versus what has been.